344 Marlborough is located on the south side of Marlborough, between Gloucester and Hereford, with 342 Marlborough to the east and 346 Marlborough to the west. 344 Marlborough was built in 1877-1878 by Keening & Fellows, masons, for real estate dealer Henry Whitwell, for speculative sale, one of five contiguous houses (338-340-342-344-346 Marlborough) they built for him in 1876-1878. He is shown as the owner on the original building permit application for 344-346 Marlborough, dated September 18, 1877, and on the final inspection, dated May 15, 1878. No architect of the houses is indicated. Click here for an index to the deeds for 344 Marlborough. By the 1878-1879 winter season, 344 Marlborough was the home of real estate broker Eben Sears and his wife, Jane Rebecca (Balch) Sears. They previously had lived at 101 Boylston. They continued to live at 344 Marlborough during the 1880-1881 season, and then, in June of 1881, purchased and moved to 342 Marlborough, next door. On August 30, 1881, 344 Marlborough was purchased from Henry Whitwell by Virginia Ellingwood (Sistare) Fisher, the wife of Warren Fisher, Jr. They previously had lived at the Hotel Vendôme. They also maintained a home at 1 Fisher Avenue in Roxbury. Warren Fisher was a former sugar refiner and merchant, and had been the primary contractor for the Fort Smith and Little Rock Rail Road. In 1876, it was alleged that he gave $130,000 in securities to Congressman (and future Senator and Presidential candidate) James G. Blaine in exchange for assistance in obtaining rights-of-way. 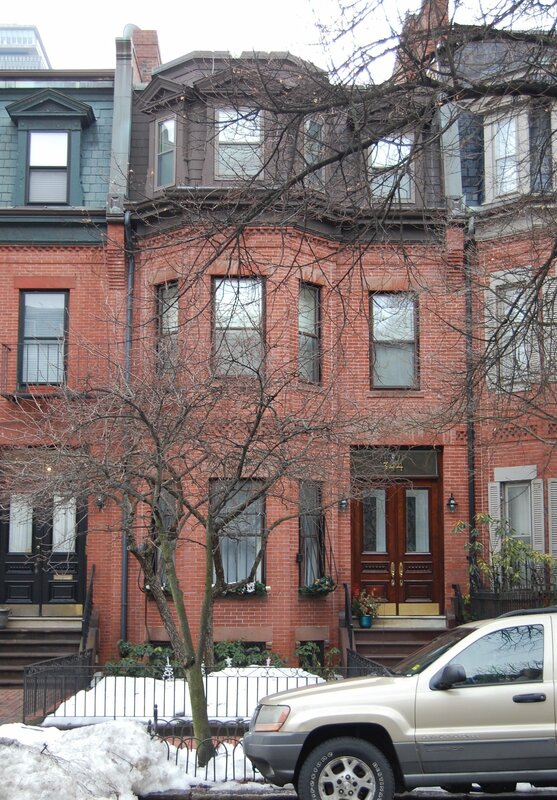 The Fishers continued to live at 344 Marlborough during the 1884-1885 winter season, but moved thereafter to Roxbury. On September 1, 1885, 344 Marlborough was acquired from Virginia Fisher by Jane Boynton (Page) Monks, the wife of Richard Joseph Monks. They had married in April of 1885. Prior to their marriage, he had lived at 111 Dartmouth, where his first wife, Marie A. (Allen) Monks, died in May of 1884. Richard Monks was a flour and grain merchant and a real estate broker, and by 1905 was agent and treasurer of the Woburn Gas Light Company. As built, the rear façade of 344 Marlborough corresponded with the houses at 338-342 Marlborough and 346-362 Marlborough. Sometime between 1890 and 1895, the rear of 346 Marlborough was extended further south, and then, sometime between 1895 and 1897, the rear of 344 Marlborough was extended even further and a wooden oriel window was added. By 1900, Richard and Jane Monks had been joined at 344 Marlborough by Jane Monks’s mother,Julia N. (Boynton) Page, the widow of William Wallace Page. 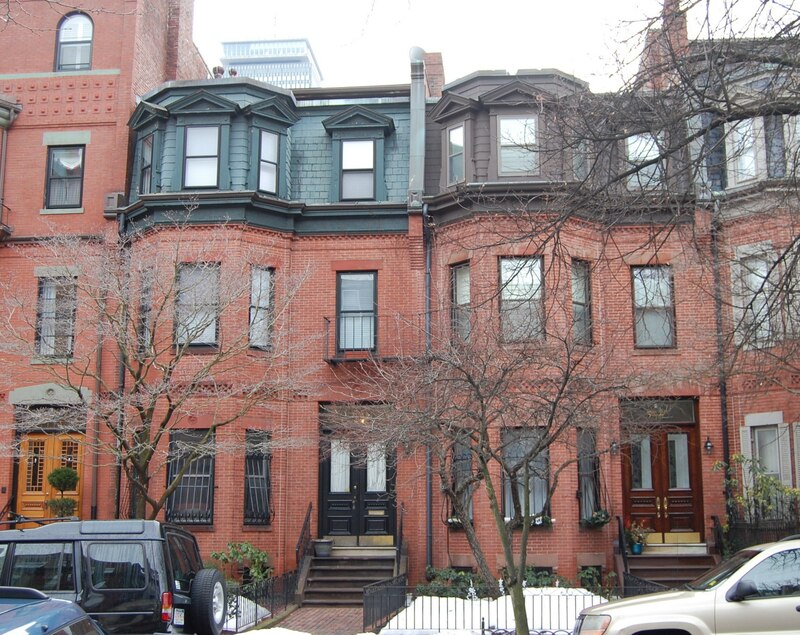 During the 1903-1904 winter season, they were living elsewhere and 344 Marlborough was the home of Louis Lawton Hopkins, manager of the Boston office of the Mutual Life Insurance Company of New York, and his wife, Maude (Hopkinson) Hopkins. They previously had lived at 74 Commonwealth with Maude Hopkins’s mother, Mary (Beers) Hopkinson, the widow of Daniel H. Hopkinson. They had moved by the 1904-1905 season and were once again living at 74 Commonwealth by the 1905-1906 season. Richard Monks died in September of 1911, and Julia (Boynton) Page died in March of 1912. Jane Monks moved soon thereafter. She continued to own 344 Marlborough and lease it to others. By 1912, 344 Marlborough was the home and private school of Miss Frances Lee. Frances Lee was a graduate of Radcliffe College, the daughter of theologian and educator James Hattrick Lee, and the granddaughter of William Augustus Stearns, president of Amherst College. She was associated with Miss Bertha Carroll’s School for several years and became her successor in 1912. She continued to live and operate her school at 344 Marlborough until about 1917, when she moved to a new building she had built at 107 Marlborough. By the 1917-1918 winter season, 344 Marlborough was the home of Hannah King (Davenport) Brown, widow of wholesale druggist Atherton Thayer Brown. She previously had lived at 480 Beacon. She continued to live at 344 Marlborough until her death in December of 1923. 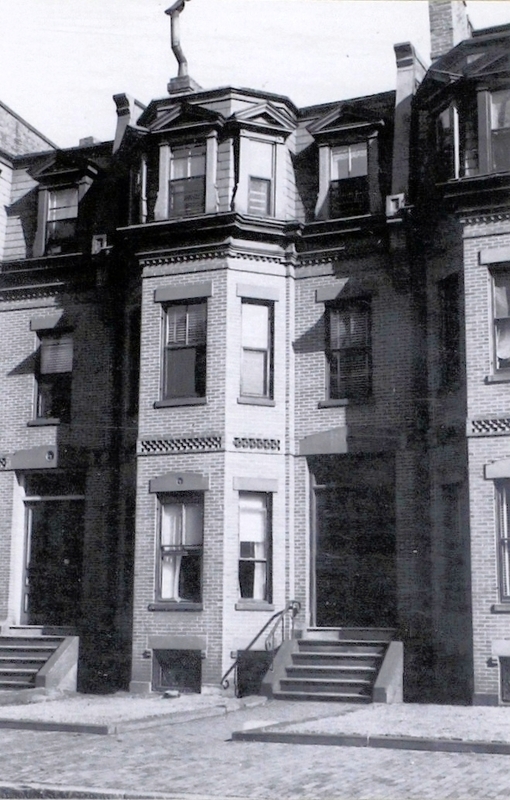 In August of 1924, Jane Monks, who continued own 344 Marlborough, applied for (and subsequently received) permission to remove the fire escapes from the building, noting that they had been installed when the property was used as a school and were no longer required now that the property was occupied as a single-family dwelling. By the 1924-1925 winter season, 344 Marlborough was the home of Gordon Chickering Prince, a trustee of estates, and his wife, Anna (Agassiz) Prince. They had married in May of 1924, and 344 Marlborough probably was their first home together. Prior to their marriage, he had lived at 290 Beacon. They continued to live at 344 Marlborough during the 1926-1927 season but moved thereafter. By 1930, they were living in Hamilton..
On May 26, 1927, 344 Marlborough was purchased from Jane Monks by real estate dealer John D. McLaughlin, Jr.
On September 6, 1927, 344 Marlborough was acquired from John D. McLaughlin by Mrs. Frances (Matherson) Paul, the former wife of Burton C. Paul. She previously had lived at 267 Newbury. She continued to live at 344 Marlborough during the 1928-1929 winter season, but moved thereafter back to 267 Newbury. On August 30, 1929, the Union Savings Bank of Boston foreclosed on its mortgage on 344 Marlborough given by John McLaughlin and assumed by Frances Paul when she purchased the house. The bank took possession of the property. 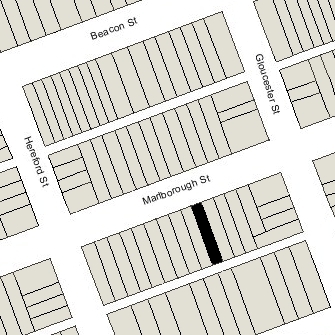 344 Marlborough was not listed in the 1930-1932 Blue Books and shown as vacant in the 1930-1932 City Directories. By the fall of 1932, 344 Marlborough was the home of Dr. Worcester Randolph (Worcester Demosthenes) Angell, a physician, and his wife, Helen N. (Hogg) Potter Angell. They previously had lived at 44 Fenway. Helen Angell was killed on October 22, 1932, struck by an automobile at the corner of Commonwealth and Gloucester. By mid-1933, Dr. Angell had moved to 5 Park. 344 Marlborough was not listed in the 1934-1937 Blue Books and was shown as vacant in the 1933-1936 City Directories. On June 30, 1936, 344 Marlborough was acquired from the Union Savings Bank by the Grand Realty Trust Company, Inc. In June of 1936, it applied for (and subsequently received) permission to convert the property from a single-family dwelling into six apartments. On December 2, 1941, Grand Realty Trust transferred the property back to the Union Savings Bank. The property changed hands and on April 7, 1947, was acquired by Esther MacNeille (Packard) McLaughlin, the wife of Richard A. McLaughlin. They had lived in one of the apartments since about 1942 and, before that, at 49 South Russell. He was a lawyer and court clerk. They continued to live at 344 Marlborough until the early 1960s, when they moved to Gloucester. On June 15, 1965, 344 Marlborough was purchased from Esther McLaughlin by Rita E. Brown of Waltham. On September 26, 1967, 344 Marlborough was acquired from Rita Brown by Margaret Henry. She subsequently married Mark B. Gordon, a mortgage broker. They lived at 100 Chestnut. He died in July of 1973. On September 10, 1974, 344 Marlborough was acquired from Margaret (Henry) Gordon by real estate dealer George Demeter. On February 22, 1979, 344 Marlborough was purchased from George Demeter by John Heudorfer and his wife, Barbara Smyth Heudorfer. In September of 1979, he applied for (and subsequently received) permission to convert the property from six to five apartments. The property changed hands and on December 24, 2002, was acquired by Mark R. Kramer. In June of 2011, he filed for (and subsequently received) permission to change the legal occupancy to a single-family dwelling, which he indicated was the existing condition.